Do you love Christ enough to die for Him? Adversity causes some men to break; others to break records. The Apostle Peter denied Christ 3 times when he faced danger. 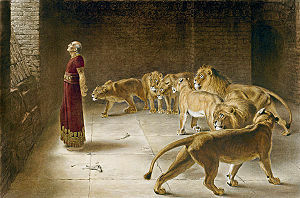 But the prophet Daniel did not compromise his religious principles, when king Darius threatened to throw him in a den of hungry lions. Instead, he remained resolute in his commitment and turned to God in prayer. Do you love Christ enough to die for Him? Believers, we may not be willing to die for Christ because our faith in God is not as strong as Daniel’s, but we should be willing to honor our commitment to Him, in any situation. Let us thrive to be like Daniel, and not like Peter before he repented. Therefore, my beloved brethren, be ye steadfast, unmovable, always abounding in the work of the Lord, forasmuch as ye know that your labour is not in vain in the Lord (1 Corinthians 15:58). Thanks a lot for that comment WATW. There is absolutely no doubt in my mind that God still delivers, and what He did for Daniel He will do for us. Clearly we do not have the faith of Daniel, or Job; but neither was Abraham nor Moses. He died for me…..so yes, Iove him enough to die for him! Speaklife1, thanks for stopping by. To be honest, I have not reach that point in my Christian life where I feel confident that I would die for Christ. I am working on it but I am yet to conquer self.